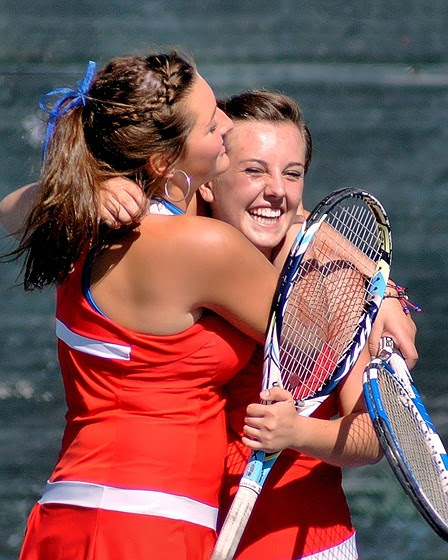 As we head into the final weeks of the high school tennis season, it’s a good time to consider the importance of athletics, both in school, and out. Sports are a powerful force that go beyond the realm of fitness, and become the basis for bringing people together; empowering one’s sense of self, and providing a future of health and healthy relationships. While we can experience tennis (the competitive and the social) as children, it really isn’t until we experience it in high school that it takes on a shape all its own. Tennis, in its most basic form, is a seemingly solitary in nature. There is singles and doubles competition. The dynamic changes when the setting becomes a high school team. Now your singularity becomes plural, and the sense of inclusion is more profound. The team setting allows you to become closer to your peers, with a shared interest. These relationships can outlast high school graduation, and span a lifetime. High school athletes are held to a different level of criteria than other students. The term “student athlete” arises out of each school’s requirement that team members must maintain a certain grade point average to participate in sports. For some students the only reason to keep their grades up may be strictly because of their desire to play on the team. Athletes are also monitored off the school campus. Team members know that if they get in trouble they may not be eligible to participate in the next match, or suspended from the team. Sports can be a great motivator for some athletes to challenge themselves academically and monitor their behavior off, and on the court. Of all the sports played in high school, tennis stands apart. The work that is done on the court is individual, but the results are tallied as a team. Coaching in tennis is not constant. Tips and consultation can only come when players are changing sides of the court, or between sets. Tennis relies on the honesty and integrity of the players to call their own lines, keep their own score and play until the match is completed, not until the clock stops. “Time outs” in tennis are limited and occur very briefly, making need for conditioning paramount. Fans of tennis are held to a different criteria as well. As a courtesy to the players, the noise during points is virtually nonexistent. Cheering should be done only when a shot has been executed successfully, not because an opponent failed at an attempt. Athletics, in general, provides life skills. They instill effort, and the notion that success is only achieved with 100% effort. Athletes have to work hard. They have to practice, condition, become students of the sport, and students in the classroom. High school athletes must be disciplined in balancing their studies and use of their free time. Athletes are role models, and must conduct themselves in a responsible manner, as a representative of their school, in order to stay on the team. Finally, our players have to recognize that in order to achieve the goal of winning, much like realizing success in life, they have to work together. As we head into Individual, and Nevada State, tennis competition over the next week, we wish all of our student athletes the best of luck and remind them to have fun. We hope this post motivates you to start thinking differently about high school athletics. We appreciate you, and if you have a moment, share any thoughts you have about your high school experience and how athletics has played a role in your life.